We are the Fordham chapter of Student Hurricane Network, a national network of law students dedicated to helping the people of the Gulf Coast rebuild and improve their lives in the wake of Hurricanes Katrina and Rita. This Blog has been set up for all those who have participated on any of Fordham's SHN trips to the Gulf Coast. We encourage each of you to share your thoughts, experiences, comments and photos. It’s time once again to join with law schools across the country in a National Day of Solidarity, which will take place on February 20, Fat Tuesday, or otherwise known as Mardi Gras! Last year’s National Day of Solidarity was a great success. And this year it is time to once again to remind the public that the struggle is not over, that tens of thousands of people are still being barred from returning to their homes, that hundreds of thousands of displaced individuals still have no way of knowing the condition of their homes and communities, that many others are still unable to enjoy the kinds of social guarantees like basic education and health care that we take for granted. And it is time to once again remind our communities that there are still those that continue laboring to uphold the fundamental rights of these people, and that they, too, need help. So on February 20th, when the focus of a celebrating country inevitably turns to New Orleans as “the greatest free show on earth,” remind your family, friends, colleagues, coworkers, and fellow citizens what’s at stake. Mardi Gras will be here soon and we've got some great events coming up this week. On Tuesday February 20th, Mardi Gras, over 30 law schools across the country will be holding events to observe a day of solidarity with the residents of the Gulf Coast affected by hurricanes Katrina and Rita. Here at Fordham, SHN and the Housing Advocacy Project will be screening This is My Home, a documentary about the fight for public housing in New Orleans. Most of New Orleans public housing withstood the hurricane with little or no damage, yet thousands of families are still shut out of their homes and remain displaced across the country. This Is My Home is a tribute to the perseverance of the displaced residents of New Orleans, and it is a call to action for the public, politicians, and all justice-minded people to support their right to return home. There will be King Cake and Two Boots Pizza. Come on out and celebrate Mardi Gras with your SHN pals. It will be a great opportunity to re-connect with folks you worked with on trips. Spring Breakers, you can get to know the people you will be working with in March. As soon as we decide where to party we will let you know. Along with Environmental Law Advocates, The Environmental Law Journal and Amnesty International, SHN is co-sponsoring a screening of Al Gore's "An Inconvenient Truth." The Number of Category 4 and 5 Hurricanes has almost doubled in the past 30 years. With 2005, the worst storm season ever experienced in America just behind us, it seems we may be reaching a tipping point - and Gore pulls no punches in explaining the dire situation. Interspersed with the bracing facts and future predictions is the story of Gore's personal journey: from an idealistic college student who first saw a massive environmental crisis looming; to a young Senator facing a harrowing family tragedy that altered his perspective, to the man who almost became President but instead returned to the most important cause of his life - convinced that there is still time to make a difference. Featuring:(9 BANDS!!!) Hungry March Band (at 12 midnight), The New York Howl, Screaming Females, The Two Man Gentleman Band, Higgins, Man in Gray, The Unsacred Hearts, The Invincible Gods, and Eisenhower. Expect some surprise performances. 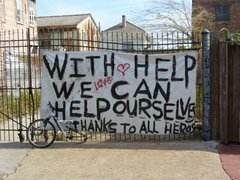 Many of us who went on the first trip to NOLA in January 2006 worked with the People's Hurricane Relief Fund. PHRF is an organization that has been successful in getting money and assistance directly to people affected by Hurricane Katrina. Hungry March Band donates their performance and any funds raised in the name of Dinerral Shavers, the snare player for the Hot 8 Brass Band who was recently shot and killed in New Orleans while driving his car. We hope to see you at these events. no displaced residents are on the hearing agenda. instead of allowing residents to return home. 4,534 units of affordable housing: 1,546 in BW Cooper, 723 in C.J. Peete; 1,400 in St. Bernard and 865 in Lafitte. projects will be *reduced from a total of 3,669 units to 1,415 units*. mixed-income units. The rest will rent at market rate. cost more than rehabbing the existing ones. units isn't right for post-Katrina New Orleans.